On the Omaha beachhead, as more and more troops and material came ashore, those remaining alive from the first wave were forcing their way inland bit by bit. 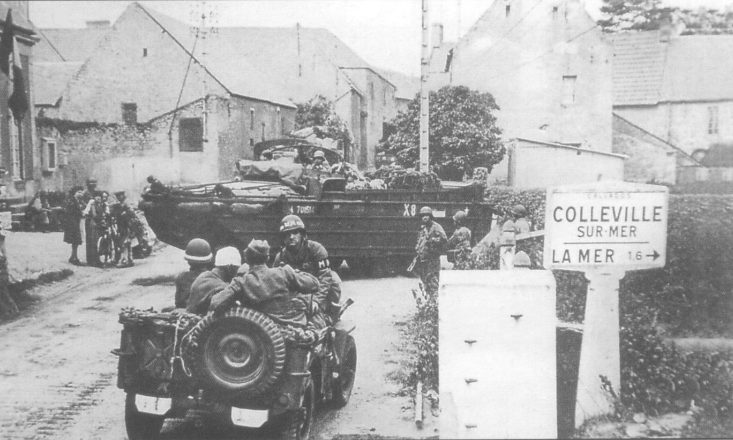 In the sector of the First Infantry Division – the “Big Red One” – the day’s objective was the village of Colleville. Lack of radio communications and smoke from day-long artillery exchanges prevented the Navy from providing expected fire support, but with German fire coming from the area, the order to attack was given. Colleville had to be taken, and without further delay. . .
Dan-o: I've played a few games, but I'm no pro. Challenge pending..
2019-01-02 (A) O Ramaille vs Matthieu M German win The American assault stalled due to lack of smoke grenades and also accurate German fire. The reinforcements helped clearing the first node of resistance. But the Germans reinforced their position preventing the Americans to dislodge despite an all fearless assault. A German decisive victory. 2017-06-06 (D) Louis Langdeau vs Reid C American win My inability to leave a good position strikes again! I held out for far too long in the central range of buildings, letting a ton of my broken units die when they were surrounded. I also let Reid take an easy foothold on the southern side of the city, and that one squad was enough to completely screw over my rout paths. My final grouping of squads held out heroically, but fell on the last American turn. 2017-05-14 (A) Seumas Hoskins vs Dean German win American opening was strong, quickly taking over the north block and encircling the Germans there as well as stealing the HMG. However, the second half of the game quickly fell apart as the American dice rolls spiked to 10s average on every IFT/MC. The game ended with every American squad either broken or locked in a melee that even on a 6-1 ratio couldn't kill the Germans. 2017-05-08 (D) Louis Langdeau vs Andrew S German win Both of us started with really hot dice, but my streak of good rolls kept going for far longer than Andy's. Coupled with an American battle plan that was a bit too conservative, it quickly led to a concession on turn 3 from the American side. 2017-05-08 (D) Louis Langdeau vs Andrew S German win We decided to give the scenario another shot since the first game was a bit one-sided. Am I ever glad we did. This was a barn burner of a game. The Germans positioned forward, fighting a delaying action, while the Americans managed to surround Colleville from all sides, pinching the Germans into a pocket. The game came down to four different melees on the last German turn. I managed to win one combat, leaving me with a single German 1st line squad in the southern buildings. Fantastic game. 2016-12-17 (D) Jeff B vs Bronson Barnhart German win German HMG and MMG were well positioned to pound the center and make moving forward difficult for the Americans, while the fringe squads caused some rout issues on the sides. The 6+1 was an effective rally machine. 2016-04-10 (A) Tom Abromaitis vs Matt Russman American win Blew through most of the defenses on the Western part of the town early with some good rolls. Americans overwhelmed the Germans once they closed in to fight in the VC area. 2014-05-02 (A) Marc Guénette vs Wray Ferrel American win Fun and fast scenario. Fast movement is required by the americans. I was able to move and secure the building the last turn. As it should be. 2014-01-16 (A) Merric Blackman vs Michael Elshaug American win The German defense stacked too many units in hexes, allowing my kill-stacks to break them, and my half-squads to surround and eliminate them. 2013-05-04 (A) Scott Muldoon vs Angus Graham American win One of those where halfway through we were both certain we would lose. Came down to the last turn, as all good scenarios do. Fear the Ami advancing fire! 2013-04-01 (D) Dmitry Klyuykov vs Anna German win Americans exhausted too early, so Germans stayed at building very comfortable. 2011-09-07 (A) Stefan C vs osterhausm American win Enjoyed my first taste of American SQ firepower. 2011-08-13 (A) Damon Baume vs Mike Restall German win Hot German dice and a rate tearing HMG made it a hard slog for the Yanks who couldn't clear enough buildings by game's end. 2010-04-21 (A) Kermit Mullins vs Scott Waites German win Boxcars ruled the day. 2009-12-05 (A) Scott Bluerock vs sbluerock German win Pounded holdouts in J3. 2 last German squads advance into 8 RFP, take NMC. One pins; one passes by 1. German win! 2009-05-11 (A) Luke Sineath vs Charlotte Tyner German win Got crushed. 2009-03-12 (A) Paul Messina vs Dave Schaaf German win I threw everything at the German and could not pull it off. Great play Dave!! !